This interesting English surname is locational. It originates from a place probably called 'Hucca's feld ' or similar, which is now 'lost'. The phenomena of lost villages is found throughout the British Isles, and it is estimated that at least five thousand surnames originate from these places, whose only reminder of their existence lies in the surviving surnames. These are sometimes found in a myriad number of variant spellings, although not in this case. 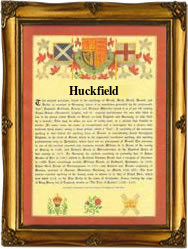 The surviving recordings suggest that the spellings are or have been Hocfield, Hogfield and Huckfield, although there may be other variations as yet undiscovered. The gazetters of England do not appear to offer any clue as to where this place may have been, or to an alternative spelling. The meaning of the name is almost certainly derived from the pre 7th century personal name 'Hucca' to give 'Hucca's field' or similar. Early examples taken from the surviving church registers of the diocese of Greater London include: Thomas Huckfield who married Mary Smallbones at the church of St Katherines by the Tower (of London), on December 9th 1674, and Jonathon Hocsfield, a witness at the church of St Ann's Blackfriars, on November 28th 1737.